But for the business traveler, I recently noticed one small feature that I'd pay more for, especially on a 2+ hour flight - A/C power. This is from 757-200(E), located near the floor directly underneath the arm rest. I've seen them on a few flights, but never mentioned by the airline. The flight attendants didn't know anything about them. 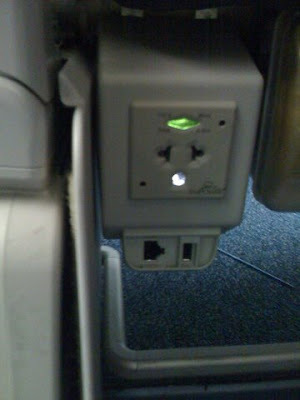 They are connected to the In-Flight Entertainment bus; in case they are off, they can be turned by by resetting the IFE bus, which can be done most easily before takeoff.